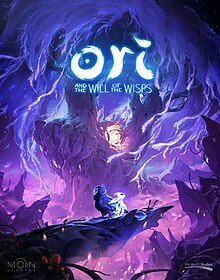 Ori and the Will of the Wisps is an upcoming platform-adventure Metroidvania video game developed by Moon Studios and published by Microsoft Xbox Game Studios for Microsoft Windows and Xbox One. It is a sequel to the 2015 title Ori and the Blind Forest and was announced during Electronic Entertainment Expo 2017. The game is planned to be a 4K UHD, Xbox One X Enhanced and Xbox Play Anywhere title. Players assume control of Ori, a white guardian spirit. To progress in the game, players are tasked to move between platforms and solve puzzles. Unlike The Blind Forest, Will of the Wisps seems to rely on autosaving rather than manually placed soul links, and the sequential upgrade system of the first title has been abandoned for a shard system more akin to charms in Hollow Knight. The game world unfolds to the player in the fashion of a Metroidvania, with new movement abilities allowing the player to access previously inaccessible areas. Some of the foundational gameplay elements were inspired by the Rayman and Metroid franchises. The game story is centered on a new adventure to discover the world beyond the forest of Nibel, uncover the truths of the lost ones, and unearth Ori's true destiny. The game was announced at Electronic Entertainment Expo 2017 (E3) on 11 June 2017 with a teaser trailer. The trailer depicts new lands, and Ori with a young owl. Gareth Coker, who performed during the E3 unveiling, was similarly announced to return to compose the score. Moon Studios lead developers Gennadiy Korol and Thomas Mahler commented that the team is "crazy iterative" when developing the game. For example, the E3 2017 teaser trailer went through 2,000 iterations during polishing. As for setting the standard and vision of the game, Mahler said that "Will of the Wisps should be to Blind Forest what Super Mario Bros. 3 was to the original Super Mario Bros..
On 7 August 2017, AM2R developer Milton Guasti was announced to have joined the Ori team as a level designer. Moon Studios released a video in October 2017 that showcased the design program used to develop cinematics of the game. The program reportedly allowed animators to make changes while in progress and thus allows for a more flexible and streamlined process. A second trailer was revealed at Electronic Entertainment Expo 2018 on June 10 2018, depicting new NPCs, bosses, movement and combat abilities, and revealing its 2019 release date. Ori and the Will of the Wisps is scheduled to be released in 2019. ^ "Ori and the Will of the Wisps announced for Xbox One". Gematsu. 2017-06-11. Retrieved 2017-08-26. ^ "Ori and the Will of the Wisps for Xbox One and Windows 10". Xbox.com. Retrieved 2017-08-26. ^ Gartenberg, Chaim (2017-06-11). "Ori and the Will of the Wisps is the new sequel to the beautiful Ori and the Blind Forest". The Verge. Retrieved 2017-06-14. ^ Smith, Graham (2017-06-12). "Ori and the Will of the Wisps announced, about sad owls". Rock, Paper, Shotgun. Retrieved 2017-08-21. ^ Grayson, Nathan (2017-06-11). "Microsoft Announces Ori And The Will Of The Wisps". Kotaku. Retrieved 2017-08-21. ^ Track written by Gareth Coker for the E3 2017 reveal can be listened to at either Bandcamp or Soundcloud. ^ "Gareth Coker announced to score Ori and the Will of the Wisps". VGMO -Video Game Music Online-. 2017-06-12. Retrieved 2017-08-25. ^ "Ori and the Will of the Wisps Developer Interview". TrueAchievements. 2017-06-15. Retrieved 2017-06-17. ^ Editorial (2017-08-21). "Gareth Coker Is A Name You Should Know In Video Game Music". Bandcamp Daily. Retrieved 2017-08-25. ^ Kim, Matt (2017-08-09). "AM2R Creator "Speechless" When Offered Ori and the Will of the Wisps Job". USgamer. Retrieved 2017-08-21. ^ "Another Metroid 2 Remake developer is designing levels for Ori and the Will of the Wisps". VentureBeat. 2017-08-07. Retrieved 2017-08-21. ^ "Ori and the Will of the Wisps Video Shows Cinematic Tool". Game Rant. 2017-10-15. Retrieved 2017-11-02. ^ Sarkar, Samit (2018-06-10). "Ori and the Will of the Wisps coming in 2019". Polygon. Retrieved 2019-03-02. This page was last edited on 2 March 2019, at 03:43 (UTC).